The lowest price of LuvLap Sunshine Baby Stroller(3, Orange) was obtained on April 19, 2019 8:39 am. It’s very good product. However the user manual was not very helpful. They should have added at least a proper color printed user manual with more details steps and do’s/don’ts. 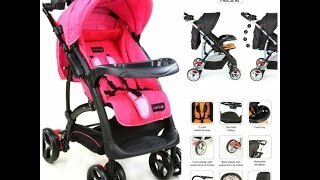 My strong suggestion for other buyers please see the youtube videos of assembling such pram and then only go ahead and try assembling it. Otherwise there is a huge chance to break it while assembling. Received defective product. There is NO gap between Front wheel and Shopping Basket rod which in tern restricting the movement of the stroller. Total Frustration. Also it could cause breakage of that front wheel or tearing of shopping basket cloth anytime. Returned that product on the same day for a Replacement. Am bit disappointed with the stroller. It looks so dull not shown in the picture and few parts are with rust seems like quite old product and also manual, wheel caps are missing.Overall I can say it’s ok ok. Not as expected and looks like old product. Superb quality and very competitive rate than you will get in any local shops. Sturdy, durable and very easy to assemble (Just 3 to 4 steps – a 7th standard kid can follow!). Great usability; one should be able to use it up to 2 years of baby age (Indian normal baby).